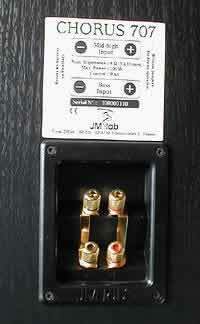 We have had JMLab speakers before on TNT, namely the Tantal 505 (see review). In the meanwhile, that series has been discontinued, and JMLab/Focal, one of France's best known audio companies, has replaced that and the higher up series of old by one, called Chorus. It comprises of a total of 10 models, including the home theater units and an active subwoofer. The model under review is third from the bottom, their largest bookshelf speaker, and there are three floorstander models above this one. 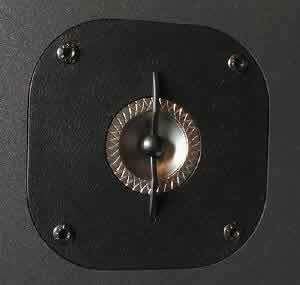 Model Chorus 707 is a 2 way speaker, with one 178 mm mid/bass driver and JMLab's proprietary 25 mm inverted titanium dome tweeter, terminated with a phase plug. The mid/bass unit uses what JMLab calls "polyglass" technology, this referring to the coating of the cone, said to consist of tiny glass particles. The manufacturer claims this improves cone stiffness while adding very little to its mass, the end result being a stiffer but still light cone, less prone to breakup than it would otherwise be. Response is given as 54-22,000 Hz +/- 3dB, the crossover being at 2,400 Hz. The efficiency is said to be 91.5 dB/1W/1m, nominal impedance is 8 Ohms with minimum impedance of 3.6 Ohms, and recommended power is 25-80W, 100W being given as maximum permissible program material power. Its dimensions are fairly generous by current standards, which seem to prefer really small bookshelves; they are 490x230x310 mm (19.3x9.1x12.2 inches, HxWxD), and its mass is given as a healthy 10.2 kg (app. 22.5 lbs). This allows us to assume its effective volume is about 22.5 liters, a very fair volume suggesting reasonable bass extension in smaller rooms. The bass reflex port is thankfully on the front baffle, thus somewhat reducing positiong problems with rear walls, but not removing them. It's a large plastic pipe, well designed into the overall appearance, in my view. On the back, you'll find two pairs of gold plated binding posts; this speaker is biwirable and biampable, as the feelings and finances take you. The supplied finish is "black ash", but "cherry" and ‘calvados" finishes are also available, all of them in fact being vinyl. However, I must note here that the quality of finish is truly outstanding for this price class, and you would be hard pressed to find better - for better, you'll have to pay much more. The only thing that betrays its relatively humble origins is the removable grille, which is mounted on a plastic frame. It did not inspire much confidence, so I removed it alltogether and did all the listening without the grilles (who am I kidding, I always do that anyway). On the back, you'll find two pairs of binding posts, connected together; this allows for biwiring or biamping, if the mood takes you. The posts are of good commercial quality, and will accept large diameter cambles; I had no problems with van den Hul 352 (5,5 mm) hybrid cables. Since the speakers were taken straight out of their packaging, I let them play for a week, or about 110 hours, before sitting down and doing some serious listening. After six days, the speakers settlind in, and the benefit was audible mostly in the sphere of microdynamics. Strangely enough, while most speakers tend to be shrill before settling in, the 707 was not shrill, in fact it was a little dull, not so much for its treble output, but for a lack of focus. This was gone after 4-5 days, but I gave it an extra day just in case. Belying its relatively modest size, this speaker will produce a clean bottom end, nicely deep. While not exceptional for its size, the bottom end is clean and well defined, and very satisfactory for smaller rooms, of up to say 18-20 sq.m. The port is in the front, which makes it less sensitive to placement, but I would nevertheless recommend no less than 30 cm from any wall, 50 cm being even better. The presence band is well protrayed, with good though not outstanding detail as with the smaller Dynaudio (which however costs four time the price). A fair amount of detail is present, but the sound stage is somewhat flat, showing a lack of depth, and quite noticably so. The treble is well extended, with no fizz effects, let alone shrillness, unfortunately so typical of modern budget speakers using titanium domes. Monsieur Mahul shows his prowess here and provides a clean, extended and well balanced high range, one you could live with for a long time without complaints. But you will know at all times you are listening to a relatively small speaker, no doubt in your mind, something the small Dynaudio managed to avoid so well. This is no bad thing in itself, as the vast majority of speakers behave that way, it's just that I have been spoiled by the diminutive Contour 1.1, which is the exception rather than the rule. Turn up the volume and the overall balance changes a little, leaning towards the bass. This is not very prominent, but it's just enough to notice, probably due to a certain impatience of the bass driver. It's as if it was just waiting to let go. I believe the young among us will rather like this. The treble driver remains composed no matter what you throw at it, up to its power rating, of course. A little to my surprise, it maintains its basic character even at very high volumes, though it does go a little hard when it gets near the top of its power handling capabilities. While remaining composed overall, the lack of sound stage depth is still there, and is subjectively more noticable than at low volume levels (which, of course, is a matter of human hearing deficiencies, not the speaker's). It improves with biwiring, not too much, but somewhat. I also jury-rigged a biamping version, using the Yamaha AX592 as the other power amp, and switching it with the trusty old H/K 6550. As ever, biamping improves matters and I would recommend it as such, but I wonder how many people will go for two power amps for speaker in this price range. 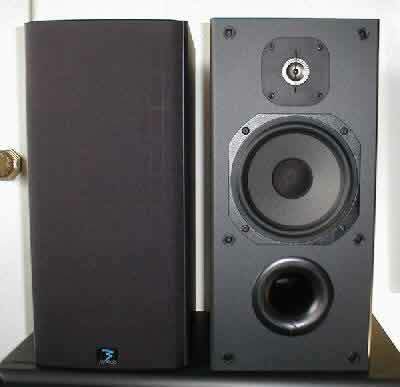 Given that the Yamaha itself costs about the same as the speaker, not many I think. I admit I'm baffled with these speakers. I simply don't know how to describe them. They do nothing wrong, but nothing particularly well either. They are not colored, and this to a fault, to the point that I fail to note their own character. Yet they are not bland, not dead at all. They are not supremely linear, but not unlinear either. They are efficient and can go very loud if necessary, yet you gain nothing by loudness and loose less then with some other designs in this price bracket. They will work well in different systems - my old H/K 6550 had no problems driving these speakers, nor did the Yamaha AX592 show any signs of stress, basically retaining their own way of portraying music. I think these speakers you could admire, but not really love, perhaps not even like. Their lack of sonic character leads me to believe that the designers, in their bid for neutrality, threw the baby out with the dirty water. You can listen to them for many hours without fatigue, but you won't be in any hurry to ask for more. Something like unobtrusive background speakers, great for cafes and smaller restaurants, but not for serious listening. Very strange speakers indeed, no personality at all. I suppose managing no personality without sounding bland is a technical achievement, but I fail to see the point of it.